Israel's army is reviewing its claim that the United Nations allowed Palestinian militants in Gaza to use a UN ambulance to transport rockets. An Israeli military official said an object seen in video footage might be a stretcher rather than a rocket. 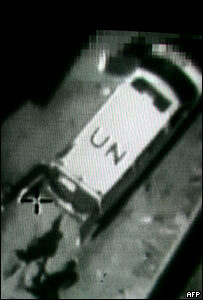 United Nations Secretary General Kofi Annan has sent a team of investigators to look into the Israeli claims. The UN relief agency chief in Gaza described them as "malicious propaganda" that endangered UN lives. Peter Hansen demanded an immediate public retraction and apology from the Israeli government. In a statement, the Danish diplomat said it was not the first time the Israeli government had "propagated falsehoods" against the United Nations Relief and Works Agency (Unrwa). Mr Hansen said Israeli ministers had in the past declared that Unrwa ambulances were carrying body parts of fallen Israeli soldiers. "When challenged to produce the evidence backing up this claim, or to retract the statement and offer an apology, the ministers in question were not able to provide any response and have remained silent," Mr Hansen said. So far there has been no public explanation about Israel's re-evaluation of the video, but the army has removed references to it from its website. An Israeli military official, speaking to journalists on condition of anonymity, said no definite conclusion had been reached about the matter. But an easing of pressure over the ambulance claims may not spare Mr Hansen from a separate controversy following remarks he made in a Canadian media interview on Sunday. In it, Mr Hansen acknowledged that some of Unrwa's 24,000 Palestinian employees were probably members of militant groups such as Hamas. "I'm sure that there are Hamas members on the Unrwa payroll," Mr Hansen said. "I don't see that as a crime." "Hamas as a political organisation does not mean that every member is a militant and we do not do political vetting and exclude people from one persuasion as against another." Mr Hansen told the CBC, however, that the UN expects all employees to act with neutrality. "We demand of our staff, whatever their political persuasion is, that they behave in accordance with UN standards and norms for neutrality," he said. Israel's ambassador to the UN criticised Mr Hansen's comments. "The very idea that individuals with clear links to the Hamas terrorist network may be on the Unwra payroll is totally unacceptable and should be properly investigated," Dan Gillerman said.